If your tongue ain’t pink, you stink! Nobody likes the smell of bad breath. It’s an obstacle that hurts your social interactions and communication. You know that moment when you are saying something important, but the other person wants to leave the conversation. And you end up alone in a world full of people. Well, it turns out, that you can freshen up your breath by doing one simple thing. By adding this habit into your personal hygiene activities you may get rid of bad breath once and for all (well, in 90% of the cases). In today’s post, I’ve compiled a list of the best tongue cleaner tools. These tongue scrapers will remove the white coat and food resides from your tongue, which causes really bad breath (halitosis). We’ll go through each of them below, so that you may decide which one suits best your oral hygiene routine. But, before that, let’s see what are the benefits of cleaning your tongue with a tongue scraper. Maintains fresh breath – This removes the bacteria from the surface of the tongue. This keeps your tongue clean, pinky, and provides a kiss-ready breath (without smelly bacteria). Improves the taste of food – Removing the white coat from the surface of the tongue exposes the taste buds and ensures enjoying the flavors of food. Prevents toxins from being reabsorbed into the body – As you sleep your tongue is covered with toxins excreted from your body. Cleaning your tongue, first thing in the morning, ensures that these toxins don’t make their way back in your body. Maintains dental health – Maintaining a pinky-clean color of the tongue contributes to a better oral health. A tongue scraper (also called a tongue brush or tongue cleaner) is an oral hygiene tool designed to remove bacterial build up, food particles, and dead cells from the surface of the tongue. There are different designs and materials you can choose from. However, most tongue scrapers are often made of metal, copper, plastic, and silicon. This tongue scraper is comfortable and gentle on the tongue. You may easily scrape the coat from the surface of your tongue by pulling the plastic handles. It is easy to use and it is just the right size and sharpness. The steel and plastic handles are durable, yet not made cheap. This tongue scraper is of premium quality. This is a smooth tongue scraper which feels good in the hand. The handles are pure stainless steel to ensure bacteria free surface. In spite of frequent contact with moisture and water, it doesn’t corrode. The design of this tongue scraper is simple and elegant. The construction is long-lasting and easy to use. 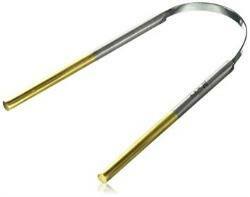 The handles are made of steel and you can remove bacteria after using this tool with a quick sterilization. You can adjust the tool to nearly any shape to fit the contours of the mouth. This is a super smooth tongue scraper. 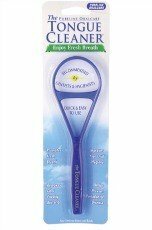 The perfectly rounded edges provide you with gentle and effective tongue cleaning. The tool is made of medical grade stainless steel and has a colored silicone ring for a personalization. For example, every member of the family may find his own tongue scraper by that silicone ring. This prevents sharing personal hygiene tools. 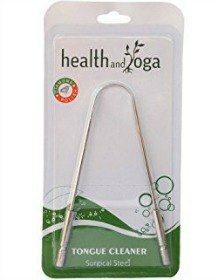 This tongue scraper is sturdy yet flexible and very easy to clean. Its shape allows it to bend in a wide or narrow curve depending which part of the tongue you are trying to reach. It has two brushing sides. One side for a sensitive tongue and the other side providing provides more harsh tongue scraping. This tool has a dual action design. You can brush your tongue with one side and then scrape away all the debris with the other side. The short bristles loosen everything and the gentle scraper cleans everything without hurting your taste buds. This is a flexible tongue scraper, but not too flimsy. The top part of the tool is of wide oval form that does the job in a couple of jobs. For individuals with a small mouth, it might seem to be too wide. This is a dual head plastic tongue scraper. The shape of the tool contours well with the tongue’s frame. It has a collection area where all the debris is stored and you don’t need to rinse it with water after each stroke. 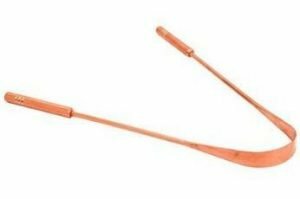 The handles are long enough to easily clean the back of the tongue. 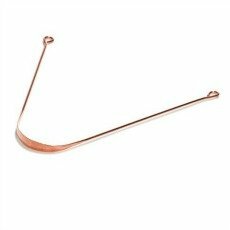 The copper material is easy to clean compared to the plastic tongue cleaners. The tool is ergonomically designed for daily use. Flexible, non-gagging design for optimal length. Recommendation: when you use this tool first get a feel of the tool’s sharpness before pressing too hard on your tongue. A gentle scrape will do the job. The low profile of the brush makes it easy to reach the back of your tongue without triggering the gagging reflex. The gel is translucent blue with a mint flavor. 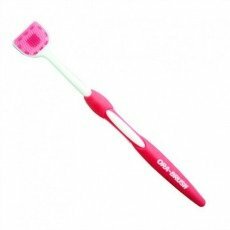 It is kind of like a hybrid between the tongue scraper and the toothbrush. The bristles are soft to the touch. The handle is as sturdy as any standard toothbrush. A tongue scraper is simple to use tool. However, you need to respect certain guidelines to ensure a safe, fresh and tongue cleaning process. rinse the tongue cleaner before and after using it. This removes the bacteria and food debris that has left on the tool. start scraping at the back of your tongue and work your way down to the tip of the tongue. scrape the entire top and side surface of the tongue, not just the center. If you use a tongue brush, move it the same way you moved the tongue cleaner from the back to the front of your tongue. rinse your mouth after cleaning your tongue. Owning a personal tongue scraper makes you conscious about the importance of personal hygiene. It adds up another good habit to the overall health maintenance. A tongue scraper may clean your tongue of bacteria and food debris, which may prevent bad breath. 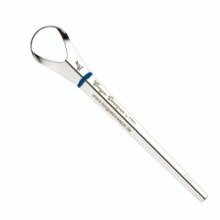 This tool may scrape the white coat off your tongue until you achieve a pinky healthy color of the tongue. Along with teeth brushing, flossing and mouth washing, tongue scraping is an important addition to your oral hygiene routine. It solves a crucial oral hygiene and social problem. And the beauty of this tool is that it’s cheap. Share with us what is your experience with tongue cleaning. Did you ever try to clean the white coat off your tongue? If yes, how did you do that?